On my first review visit south of the river, I decided the best place to begin would be Brixton Village. Once a run-down old market, some inventive thinking by the local council has seen this area regenerated – or is that gentrified? While the market is now a nice place to visit for coffee and food lovers, with numerous trendy cafes and restaurants like Champagne + Fromage, I’m not sure whether the people who have been living in Brixton for the past few decades are really going to be spending their hard earned cash on Snails and Fromage. The market is really two markets – the local food and fish market for the locals and a food venue for people who’ll probably move away from the area in a few years. While I appreciate the effort by the council, I’m not sure that companies like Honest Burger or French Bubbles really represent what Brixton is about – but maybe I’ll be proved wrong in the long-term. Rant over, on to the reviews. I visited two venues on this visit, and I will be back, so make sure to Tweet your recommendations to me at @cafe_review. The first was a lunch and coffee trip to Wild Caper, an eastern Mediterranean deli cafe. Wild Caper looks like the sort of place that should serve a great coffee. Loaves of bread sit outside with its rustic seating welcoming you to sit down and take like at a gentler pace. Inside, a blackboard tells of the various coffees on offer and the décor is super stylish. But it really was a bland cup of foamed milk. Very little taste and presented in a tiny tea cup. The only taste I could put my finger on, apart from milk, was sourness. Apparently, it serves Monmouth Coffee – but I couldn’t taste it. Maybe they’d forgot to add it. 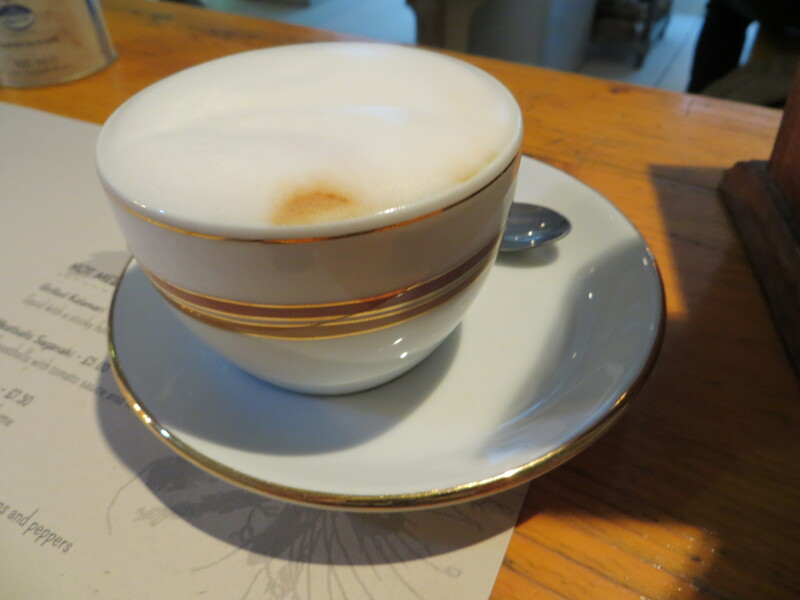 You can see from the picture below how pale and uninteresting the coffee looked. As I mentioned, this is a nice looking place with a stripped down minimal decor of white walls and just three long tables with benches. 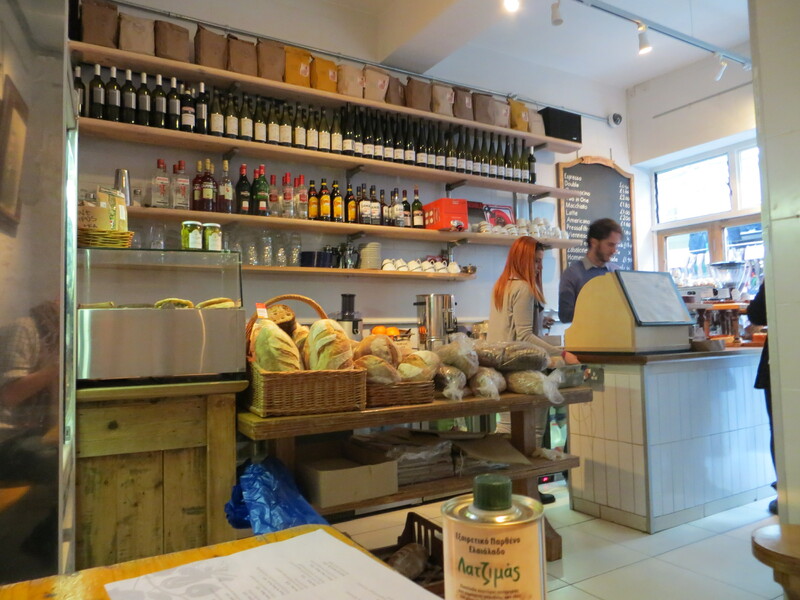 Along the back wall was the deli with tasty looking loaves, bottles of wine and bags of coffee. Outside the front were a couple of high tables looking onto the market. It’s a nice place to sit and I imagine during a busy lunch service the atmosphere will get very Mediterranean, with people chatting over their lunches and a glass of wine. Having had my awful coffee, I was dreading the arrival of the food. However, I was more than pleasantly surprised. I ordered the Pork Belly Wrap with a side of chips. Fitting with the Med theme, the wrap was actually more of a Pita bread, which was crisp on the outside and soft and fluffy inside. The pork was tender and tasty and the onions, tzatziki and tomatoes added a freshness to the whole meal. The chips were perfectly cooked with just a hint of herbs. At just under £5 for the wrap, it was truly an excellent meal. The rest of the menu also looked very interesting with the likes of Meatballs Saganaki, Chicken and Bacon Skewers and Smoked Aubergine Dips standing out. 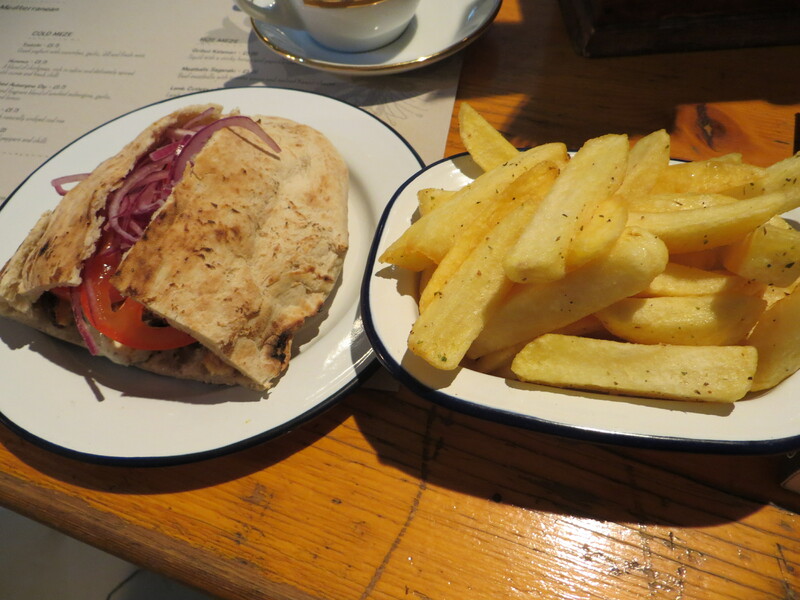 Pork Belly Wrap with Chips – Wow! The ups and downs continue at Wild Caper. Maybe that’s where the ‘wild’ in the name comes from. On arrival while trying to place my order at the deli, I was told, rather curtly and rudely, to take a seat. While the speed of the service was good, the attitude was, well, a bit Mediterranean. Also, a bottle of what looked like spray on olive oil was left on my table during the course of the meal. When you open in a market like this, there’s plenty of opportunity to become part of the area and embrace the community. 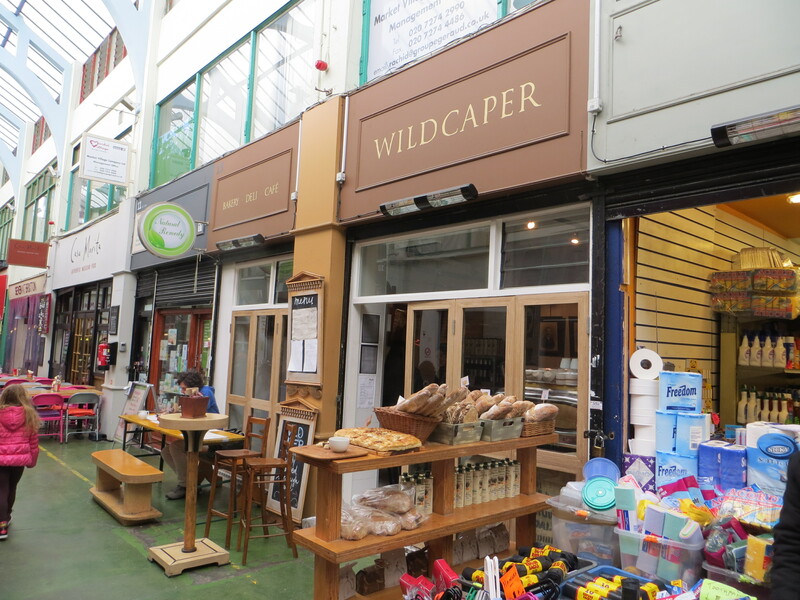 Apart from a bit of art for sale and some excellent looking bread, Wild Caper didn’t offer anything more than bad coffee, excellent food and a nice place to sit. With a bit of an attitude shift and a proper barista, there’s no reason this couldn’t be a choice venue among the many cafes and restaurants in the market. The competition must be so massive that it amazes me these little niggles can last. Still, an excellent place for lunch – but maybe go for a glass of wine instead of coffee.